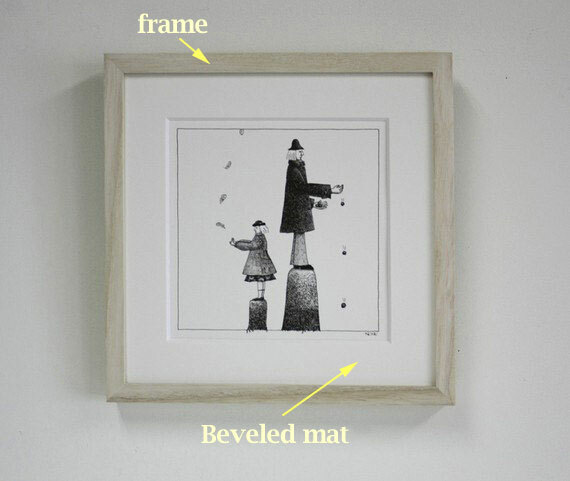 The proper way to frame a pencil drawing is with a frame, mat and glass. Frames for pencil drawings should be kept simple, never gaudy and elaborate. The mat should have a bevel cut into it, if possible, and there should always be glass (to protect the fragile drawing from being smudged). Always spray fixative on the drawing and allow it to dry completely. Although the pencil drawing won't ever be in contact with the glass, this is a good precaution. Since the drawing sits behind the mat, there is the thickness of the mat between it and the glass. That's part of the reason for the mat, plus it looks good, too. Conversely, framing a pencil drawing without a mat allows the surface of the drawing to touch the glass, and it just doesn't look as nice. Set your scanner at 150 ppi (pixels per inch). You don't need to go any higher than that, and you don't need to use photographic paper. You can get premium quality printing from an ordinary HP printer, like I have, with 150 ppi. By the way, the screen that you are looking at right now is 72 ppi, so the resolution will be twice as high as that. And since original drawings aren't done on photographic paper, they should be printed out on ordinary paper. Anywhere that sells frames, such as Aaron Brothers or The Hobby Lobby, sells them in standard sizes. And they sell the mats in standard sizes to fit into those frames. So, if your drawing will look good in an 8 X 10 mat, you need to get an 11 X 14 frame. Please don't ask me where these standard sizes came from, all I know is that it is a whole lot cheaper to buy standard size frames and mats that to have them custom made. So you can pick out the frame you want and get the mat you want (with the beautiful bevel already cut), put them together, size your drawing on your computer, print it out, and put it all together. And that's the trick! Something that can look even better, and be even cheaper than buying a frame and a mat, is to buy a framed print at a place like Big Lots. Just take out the print of the palm tree picture or whatever and replace it with your drawing. Hang it up on the wall and it will look great! Good to know! My sketch is not a Picasso, but I do want to frame it and be able to show it off proudly.